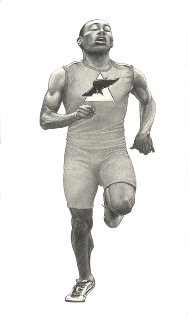 The illustration is a rendering of All-State sprinter Tim Faust. 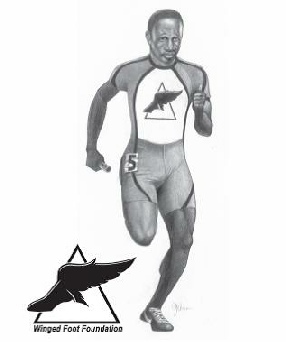 Tim was named the Winged Foot Foundation’s 2011 Athlete of the Year. As a Thornton HS Senior, Tim won the 100, 200 and anchored the first place 4x200 relay at the 2011 Illinois State Track & Field meet leading Thornton's team to a 3rd place finish. These athletic accomplishments and academic success (3.5 GPA) helped Tim earn a scholarship to Ohio State University. To celebrate these achievements, award winning artist Jim Weren drew the rendering of Tim Faust for the Winged Foot Foundation. 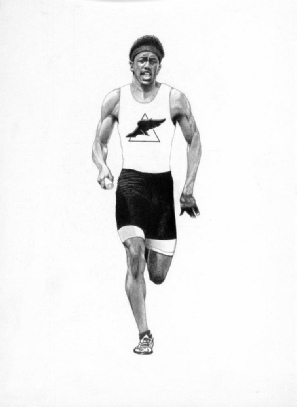 The illustration is a rendering of the 2012 Student Athlete of the Year, Marlon Britton. He lead his team at Leo Catholic HS to their 2nd consecutive state championship. Marlon anchored LEO’s 4x100 Relay to First Place with a time of 42.76 and he placed 2nd in the 100 Meter High Hurdles in 14.69. 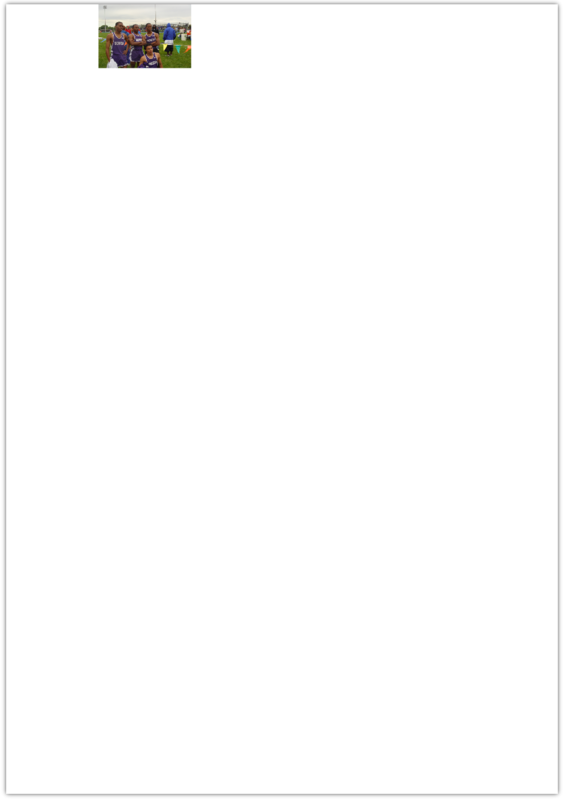 The LEO Senior currently has a 3.61 GPA. 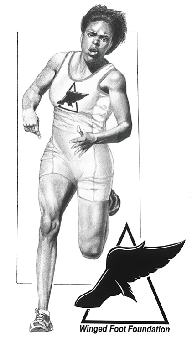 The illustration is a rendering of the 2010 Student Athlete of the Year, Ashley Stacey. Ashley’s performances at the Illinois State Meet were phenomenal as she lead her team to a 3rd place finish!!! Kenneth is being recognized for his outstanding academic & athletic accomplishments in the 2013 school year. Committed to a year round training schedule, Kenneth has enjoyed great success in cross country and on the track demonstrating impressive range from 100 meters to 3 miles. After his runner-up finish in the 2012 State Meet 400 (48.33) and 8th place finish at the Nationals (47.94) in his Junior year, Kenneth was committed to getting stronger in his senior year by way of a solid cross country season and qualifying for the State Cross Country Meet. The ultimate goal was to carry that endurance into the 2013 track season and capturing the State Meet 400 meter title. The Thunderbird senior, enjoyed a successful cross country season highlighted by a personal best 3 mile time of 15:33 at the State Cross Country Meet. The indoor track season was even more impressive leading Illinois with the season’s best 400 time of 49.31. The outdoor season was marked with impressive performances in the 100 (10.99), the 200 (22.17) and 400 (48.82) but a muscle strain at the Sectionals prevented Kenneth from qualifying for the State Track Meet. With a graduating GPA of 3.61 and a bright Track future ahead of him, Kenneth is on his way to the University of Illinois where he will be competing for the Illini in the 2014 track season. 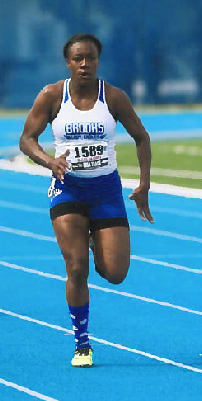 Ebony McClendon of Chicago’s Brooks College Prep Academy is the WFF 2014 Athlete of the Year for her performances all season and especially at the Sectional and State Meets. At State, Ebony placed in 4 events, pacing her Brooks team to an overall 5th place finish. Ebony was All-State in all 4 events: 2nd in the 100 (11.80), 2nd in the 200 (24.39), 3rd in the 4x200 (1:42.23) and 5th in the 4x100 (48.76). Ebony also represented the University of Chicago Track Club in the off season. Her most notable club races being her: Indoor 60 Meter dash in 7.45, ranked 6th nationally and her 11.73 & 24.26 double at the Outdoor AAU National Jr. Olympics. Ebony is not only an excellent athlete she is also an exceptional student. As a result of all her hard work in the classroom and on the track, Ebony accepted a scholarship to the University of Wisconsin-Madison. Pavlo Hutsalyuk achieved his goals in the classroom and on the track during his Senior year at Lane Tech. In cross country, Pavlo was the Chgo. Public League Champ, 9th at the Regional, 14th at the Sectional and covered the State Meet 3 mile course in 15:29 for 114th. During the Indoor Track season, Pavlo posted the 5th best 1600 meter time in Illinois at 4:19.1, a 1:57.8 800 m. and a very fast 1:26.7 in the 600 m. Outdoor, Pavlo recorded several personal best times and titles: :50.38 400m., 1:51.58 800m., 10:04 3200 m., Sectional 1600 m. Champion 4:18.2, 3A State Meet 1600 m. Champion 4:08.19. Pavlo was named the Lane Tech team MVP and is also an excellent student, AP Scholar and recipient of President's Award for Educational Excellence. Spring 2016, Pavlo will be racing for the University of Iowa.